The Black Diamond Series features a unique gloss finish with a sleek brushed texture; displaying a deep colour that creates an elegant, striking impact. Choose from Red Diamond, White Diamond or Black Diamond, and make your personal design vision a reality. Special painting technology on the housing surface lends the Black Diamond Series a particularly deep colour and an elegant, striking finish. Choose from Red Diamond, White Diamond or Black Diamond, and make your personal design vision a reality. The 3D i-See Sensor enables a new level of truly personalised comfort to be achieved with customisable airflow control. Working in conjunction with the dual split vane design, the 3D i-See Sensor is able to direct customised heating or cooling where it is needed most. As a result, it can save energy by ensuring no unnecessary heating or cooling to areas that don’t require it. The 3D i-See Sensor is able to provide features such as Indirect or Direct Airflow, Even Airflow, Auto-Off and Energy Saving Mode. The 3D i-See sensor works in conjunction with the dual split vanes to provide heating or cooling to where it is needed most. As a result, it can save energy by not heating or cooling areas that don’t require it. Whether you prefer direct, indirect of evenly distributed airflow, the 3D i-See Sensor provides the ultimate in customisable airflow. The 3D i-See sensor can recognise movement of an individual in a room and subsequently direct the airflow with the dual split vanes; so they continue feeling warm no matter where they have moved to in the room. The 3D i-See Sensor can identify multiple people present in the room and adjust the dual split vanes to direct heating or cooling evenly throughout; so everybody feels comfortable in the room. Only one person feels direct heat. Both people feel direct heat and are both comfortable. The patented Mitsubishi Electric Dual Barrier Coating prevents dust and dirt from accumulating on the inner surface of the heat pump; keeping your heat pump clean year-round. Blended “fluorine particles” prevent hydrophilic dirt penetration and “hydrophilic particles” prevent hydrophobic dirt from getting into the air conditioner. As a result the patented dual coating on the inner surface continues to keep key internal heat pump components clean. Keeping key internal components like the heat exchanger, the fan and the internal duct clean is important for both home comfort and efficiency. Not only does dust and dirt build up typically create unpleasant odours, but it also forces a heat pump to work harder, which can result in significantly impaired energy efficiency. Dual Barrier Coating is the world’s first coating technology to prevent dust and oil build up in the interior of the heat pump for the ultimate in peace of mind, ease and comfort. While ordinary heat pumps produce less heat below 7°C, only Mitsubishi Electric HyperCore® Technology guarantees its fully rated capacity right down to -15°C so you get all the heat you paid for. If you experience cold temperatures and/or high humidity during the winter months then a HyperCore high wall is perfect for you. It is the only heat pump guaranteed to produce its fully rated capacity right down to -15°C, HyperCore ensures superior heating performance, regardless of outdoor temperatures. As the graph shows, even though both heat pumps are rated to provide 6kW of heat, their performance differs greatly as the temperature drops. While the standard heat pump produces less heat, the LN50 6kW HyperCore High Wall model continues to deliver the full 6kW you paid for. The best low temperature performance heat pump combined with rapid heating ensures warmth when you need it. 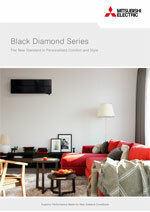 The Black Diamond Series are some of the most energy efficient heat pumps available in New Zealand. The LN25 model even boasts the maximum 6 star energy rating in heating – which means superior energy efficient performance all winter long. Mitsubishi Electric Heat Pumps are designed to be very, very quiet. Constant development to reduce sound levels has resulted in our Black Diamond Series High Wall indoor units starting at an amazingly quiet 19dBA. Mitsubishi Electric Heat Pumps are designed to be quiet on all fan speeds. In addition, the introduction of a quiet fan speed provides truly quiet operation without compromising on comfort levels. More on the importance of quietness. Mitsubishi Electric Heat Pumps are designed to be very, very quiet. Constant development to reduce sound levels has resulted in our Black Diamond Series High Wall indoor units starting at an amazingly quiet 19dBA. And for the perfect night’s sleep, the Black Diamond Series features Night Mode; lowering the outdoor operating noise level by 3dB. Wi-Fi Control Built In for the ultimate in comfort control no matter where you are. Never return to a cold home again! With Mitsubishi Electric built –in Wi-Fi Heat Pump Control you can pre-heat or cool a room no matter where you are. On the way home, running late, coming home early, or even when you're in a different country, with Wi-Fi Control you'll always arrive home to total comfort regardless of what New Zealand's unpredictable weather is doing outside! Now also Alexa Voice Enabled! Hands free heat pump operation is now a reality. Any Mitsubishi Electric heat pump that is connected with Mitsubishi Electric Wi-Fi Control can now utilize an Amazon Alexa Smart Speaker to control the temperature in the home with simple voice commands. Coming home carrying the shopping? Cooking up a storm in the kitchen? Hands full during family playtime? Searching for the remote control in a dark room? This will be a thing of the past – now you can simply talk to your heat pump! *Please note that due to the reflective and multilayered finish of the Black Diamond Series indoor units, the colours shown within this brochure are indicative only. While every effort has been made to display the units as they appear in person, due to variables such as lighting and positioning affecting the appearance, we recommend viewing the Black Diamond Series at your nearest showroom.